A podcast about personal growth, self-improvement, and taking back control of your life. Many of us are going through life on auto-pilot, following what everyone else is doing. We have become complacent in our misery and are unsure how to change it. But we can change it, and we need to. The first step in taking back control of your life is making the choice to do so. I'm hoping this podcast can help you do that. Today, I discuss how I let my dreams keep me from taking action. I dreamed a good portion of my life away and I don't want you to make the same mistake. Take Back Your Life is a podcast about personal growth and regaining control of life. Today, I discuss how we can get so caught up in trying to achieve what others are achieving that we fail to see the meaning in our lives. There is nothing wrong with being average or ordinary as we are the only ones who can give meaning to our lives. Take Back Your Life is a podcast about personal growth and regaining control of our lives. In today's episode, I talk about why it's important to forgive yourself for the mistakes you make. Take Back Your Life is a podcast about personal growth and regaining control of life. Today, I discuss the only place you need to be. The present moment is all we have and many of us let our thoughts and worries take us out of that moment. But being present in your life is one of the most important things we can do for ourselves and others. Take Back Your Life is a podcast about personal growth and regaining control of your life. The profound way Stoicism can impact your life. Today, I discuss some of the the ancient Stoics including Seneca, Marcus Aurelius, and Jean-Paul Sartre, what they taught, and how much of an impact they have had on my way of thinking and my life. Take Back Your Life is a podcast about personal growth and regaining control of life. Why you should trust your instincts. In today's episode, I talk about why you should trust your instincts and the importance of that "gut" feeling you are having. Take Back Your Life is a podcast about personal growth and regaining control of your life. Experience life through a new lens - Learning to say why not and be open to new experiences. In today's episode, I discuss why we should step out of our comfort zone and experience life a little differently. Remembering a simple two-word phrase has helped me become more open to life and to those around me. Take Back Your Life is a podcast about personal growth, self-improvement and regaining control of life. What can you choose to leave behind today? Making the decision to let go of what doesn't serve you. In today's episode, I discuss how stress can affect our lives and how one simple thing can help you leave behind those things which do not serve you. Take Back Your Life is a podcast about personal growth, mental health, and regaining control of your life. How to continue on the path to your goals - Lessons from my marathon. In today's episode, I discuss how we can continue (or even begin) on the path to achieving what we want and how a simple message from my marathon reminded me it's not as difficult as we make it out to be. Take Back Your Life is a podcast about personal growth, self-improvement, and regaining control of your life. What decisions have you made about yourself? And are they really true? Today I talk about how we make decisions about ourselves and they become our truth. These decision about how we aren't good enough or how we can't achieve certain things keep us from a life we want. But most of them aren't true, and I want you to think about the decisions you've made about yourself. Take Back Your Life is a podcast about personal growth, self-improvement, and regaining control of life. You don't need permission to live your life. Today, I discuss how many of us carry the need to ask for permission from our childhood into being an adult. But you don't need permission to live life how you see fit. It's been granted. Take Back Your Life is a podcast about personal growth, self-improvement, and regaining control of life. It's time to begin your life - by design, not by default. In today's episode, I discuss why we should design our life and not let it be determined by default - what other people are doing. It's time to take control of your life and live it the way you want. Take Back Your Life is a podcast about personal growth, self-improvement, and regaining control of life. You are allowed to be kind to yourself - overcoming self-criticism and negative self-talk. In today's episode, I discuss how we can start the process of being a little kinder to ourselves and how to begin to overcome the self-criticism and negative self-talk so many of us participate in. Take Back Your Life is a podcast about personal growth, self-improvement, and regaining control of life. You don't have to explain yourself. The need to justify our choices. In today's episode, I discuss the need many of us have to explain ourselves and our choices to others, and why you don't need to. Take Back Your Life is a podcast about personal growth, self-improvement, and regaining control of your life. Overcoming self-doubt and why it keeps you stuck. In today's episode I discuss how my self-doubt kept me stuck, and how I overcame it. We are all riddled by self-doubt. It keeps us from accomplishing our goals and can lead to a life of misery. To overcome this self-doubt and negative self-talk, we need to focus on four certain areas. Take Back Your Life is a podcast about personal growth, self-improvement, and regaining control of your life. In today’s episode, I discuss one of the first steps in starting the process of regaining control over your life, and that is getting completely honest with yourself and your problems. Take Back Your Life is a podcast about personal growth, self-improvement, and regaining control of your life. On relationships, dating, and vulnerability. Every moment matters. In today's episode, I discuss how we should allow ourselves a little more vulnerability when it comes to dating and relationships. Take Back Your Life is a podcast about personal growth, mental health, and regaining control of our lives. In today’s episode, I discuss how the miserable life I was living became unacceptable and I began to think about what would be the alternative to that life. I want you to think about whether you are living the life you want. If not, make the choice to change. Take Back Your Life is a podcast about personal growth, mental health, and regaining control of your life. Clueless about your future? You are not alone. In today’s episode, I discuss why we don’t need to know everything about where our life is headed. It’s okay to not know what your future will look like. Because most people don’t. 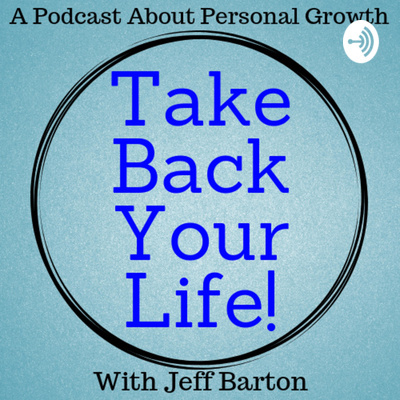 Take Back Your Life is a podcast about personal growth and regaining control over our lives. Stop talking yourself out of what you want and go for it! In today’s episode I discuss how to stop talking yourself out of what you want. Take Back Your Life is a Podcast about self-improvement and regaining control of your life. In today’s episode I discuss the importance of being yourself. Take Back Your Life is a Podcast about self-improvement and regaining control of your life. Why YOU are the cause of all your problems. In today’s episode I discuss why your problems are caused by you and only you. Take Back Your Life is a Podcast about self-improvement and regaining control of your life. In today’s episode I discuss the selling of our time in jobs we hate and the myth of the work-life balance. Take Back Your Life is a Podcast about self-improvement and regaining control of life. Are you in control of your life? Or is life controlling you? In this episode, I talk about being in control of life and chasing dreams. Take Back Your Life is a Podcast about self-improvement and regaining control of life. Today on the Podcast, I talk about healthy versus unhealthy relationships. Take Back Your Life is a Podcast about self-improvement and regaining control of your life. How to deal with judgment from others. In this episode I discuss how to deal with judgment from others and why you should follow your own path. Take Back Your Life is a Podcast about self-improvement and regaining control of life. Courage in the face of fear. In this episode I tell a little story about courage in the face of fear and overcoming anxiety. Take Back Your Life is a Podcast about self-improvement and regaining control of life. In this episode I discuss choices. A lot of us choose things which upset us. We choose negativity instead of choosing things which excite us. By learning to focus on things we can control, our lives improve. Take Back Your Life is a Podcast about self-improvement and regaining control of your life. In today’s episode I discuss lessons about life I’ve learned along the way. These lessons are to help you improve your own life. Take Back Your Life is a Podcast about self-improvement and regaining control of your life. In today’s episode I discuss finding your purpose by taking a look at your passions. Take Back Your Life is a Podcast about self-improvement and regaining control of your life. In this episode of the Podcast, I discuss thoughts and how we can learn to control them. Take Back Your Life is a Podcast about self-improvement and regaining control of your life. In this episode, I discuss the meaning of success. 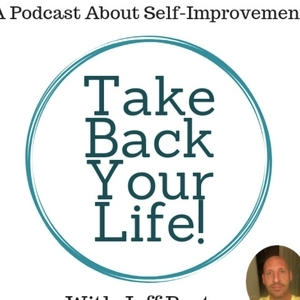 Take Back Your Life is a Podcast about self-improvement and regaining control of your life. In this episode I discuss the final obstacle to change which is YOU! This is the last episode in the Obstacles to Change series. Take Back Your Life is a Podcast about self-improvement and regaining control of your life. This episode is a continuation of the Obstacles to Change series. Today I discuss Personal Responsibility. Take Back Your Life is a Podcast about Self-Improvement and regaining control of your life. In this episode, I continue the Obstacles to Change series. Today, I talk about excuses we use which keep us from improving our lives. Take Back Your Life is a Podcast about self-improvement and regaining control of your life. In this episode I discuss the number one obstacle to change: FEAR! Take Back Your Life is a Podcast about self-improvement and regaining control of your life. This episode of the Podcast is about improving our lives through our choices and actions.